Sometime back, I mentioned that I tried to load up our taxonomy (with about 1 million medical concepts), into TGNI's Lucene and Neo4J datastores, and the process took 3 weeks to complete (on my 2 CPU desktop at work, as a single threaded process). I've been meaning to see if I could speed it up, but the data was adequate for most of the experiments I was doing, so I did not have enough incentive. Until about 4 weeks ago, when I discovered that I had inadverdently pulled in retired and experimental concepts and that they were interfering with the quality of my output. My initial plan was to convert the loading process into a Map-Reduce job with Hadoop, but I would have to server-ize Lucene and Neo4j (ie, using SOLR and Neo4j's REST API), and the prospect of having to start up 3 servers to test the application seemed a bit daunting, so I scrapped that idea in favor of just multi-threading the loading application. Although, in retrospect, that would have worked equally well (in terms of effort involved to implement) and would have been more scalable (in terms of the hardware requirements - its far easier to get a bank of low-powered servers than it is to get a single high-powered server). In this post, I describe the somewhat convoluted process that led to a successful multi-threaded loader implementation, hoping that somewhere in this, there are lessons for people (like myself and possibly a vast majority of Java programmers) to whom writing non-trivial multithreaded apps is like buying a car, ie, something you have to do only once every say 5-7 years. To provide some context, here is what the flow in my original (single threaded) loader looked like. 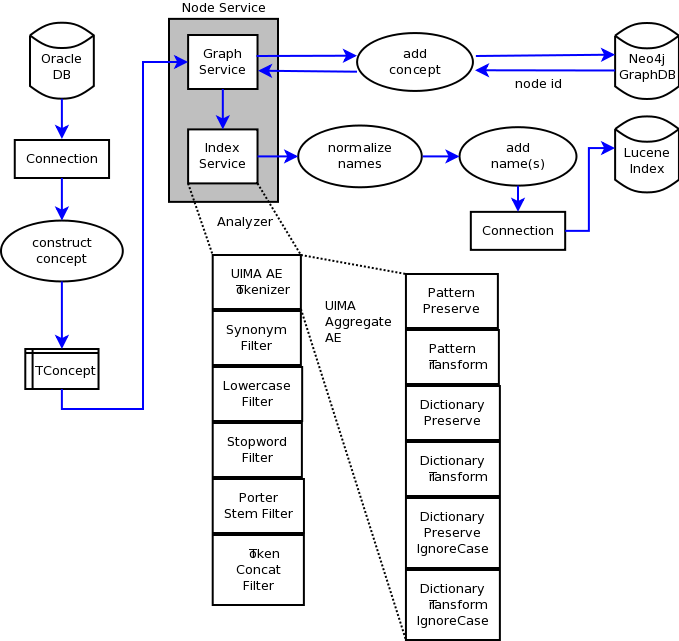 The code would loop through a bunch of tables in an Oracle database and build concept objects out of it, then send the object to a node service, which consisted of a graph service and an index service. 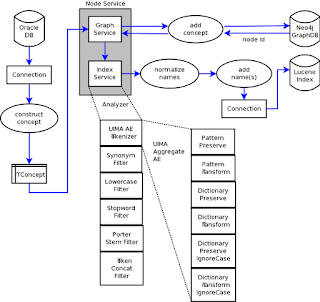 The concept would be added to the Neo4j graph database (and get a node ID in the process), then it would be sent to the index service, which would pass it through the UIMA/Lucene analyzer chain to create an entry (heavily augmented with attributes) in the Lucene index for each name (primary, qualified, synonyms) associated witht he concept. My first implementation was to build a list of OIDs from the Oracle database, then spawn a fixed size thread pool using Java's ExecutorService. Each thread would then build a TConcept object, write to Neo4j, normalize the names and add them (as distinct entities) to the MySQL database. This would run through about 3,000 concepts before hanging. Thinking that perhaps it was something to do with the way I had integrated UIMA with Lucene analyzers, I broke them apart so the UIMA Analysis Engine (AE) would annotate each input name, then break them apart into (potentially) multiple strings, then feed them in, one by one, into the Lucene analyzer chain consisting of streaming Lucene only components (keyword attribute aware LowerCaseFilter, StopFilter and PorterStemFilter). 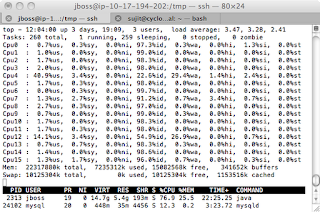 While I was doing this, I decided to switch out Lucene and use MySQL instead. I was pre-normalizing the names anyway, and I needed to match normalized versions of my input against normalized versions of the concept names. Using Lucene wasn't buying me anything - it was actually hurting because it would match partial strings, and I was having to write code to prevent that. However, the pipeline would still hang at around the same point. I remembered that I had used Jetlang some time back, and decided to see if modeling it as a Jetlang actor would help. This version ran through about 70,000 concepts before it hung. While I was running this version, I noticed that the CPUs ran a lot cooler (using top and looking at the user CPU consumed) with the Jetlang version compared to my original multithreaded version. At that point I realized that each of my threads in my original version was creating its own version of the UIMA AE, Lucene Analyzer and database Connection objects for each concept. Since Jetlang uses the Actor model, its threads were basically mini-servers that looped in a read-execute loop. In an attempt to keep the code mostly intact (I was trying to reuse code as far as possible), I factored out these resources into pools using Commons-Pool and replaced the constructor (and destructor) calls with calls to pool.borrowObject() and pool.returnObject(). This helped, in the sense that I noticed less CPU utilization, but the job would just mysteriously block at around the same point, ie, no movement in the logs, top showing no activity except in one or two CPUs. Digging deeper, I found that chemical names were being caught by my semantic hyphen transformation pattern (meant to expand hyphenated words into two word and single word tokens), and were generating thousands of synonyms for them. At the same time, I realized that I could dispense with the pools altogether by modeling my threads as mini-servers (with a for(;;) loop breakable with a poison pill message) and giving each thread its own copy of an UIMA AE, Analyzer, Oracle and MySQL Connection objects. Neo4j allows only a single connection to the database, but is thread-safe, so I wrapped the connection in a singleton and gave each mini-server a reference to the singleton. For chemical names, I put in an additional AE and changed the flow so if a string (or part of it) was already annotated, a downstream AE will not attempt to annotate it. However, just in case there were other wierd patterns lurking in the input, I wanted to be able to terminate the normalization process (and not process the concept) if it took "too long" to execute, so it did not hold up other concepts that could be processed. With all these requirements, I ended up modeling the job in three levels - the manager which instantiates everything and creates a queue of input ids to process, a pool of worker threads which are mini-servers and which have their own instances of expensive resources, and normalization tasks, which are instantiated as callable futures from within the worker threads, and which timeout after a configurable amount of time (default 1s), and cause the UIMA CAS (an expensive resource that should be destroyed according to the UIMA docs) to be released and the AE rebuilt with a new CAS when that happens. Here's the code (with the application specific stuff elided to keep it short, since it adds nothing to the discussion). // will not be written out into Neo4J. 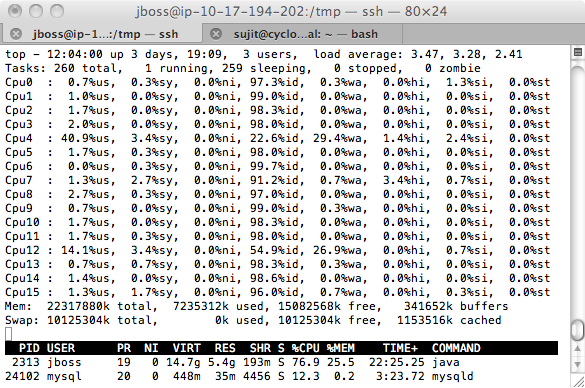 I set the number of worker threads to 22 on my 16 CPU machine. During the run, I noticed that the load average was between 3-4 (which is quite low for a 16 CPU box) and the user CPU utilization percentages hovered in the 2-3% mark on most but 2-3 CPUs, which showed around 40-50% utilization. So there is probably still some room for increasing the number of worker threads. Here is a screenshot of top while the program is running. With 22 threads, the job finished in a very acceptable time of about 1.5 hours, with 88 concepts timing out. I plan to look at those concepts to see if I can uncover patterns that would lead to the creation of some more pre-emptive AEs in the future. Meanwhile, I hope I'll remember this stuff the next time I need to build one of these things :-). Its almost Christmas, so for those of you who celebrate it, heres wishing you a very Merry Christmas!